We at The Angel’s Ashes conduct elegant and intimate military burial services. We understand that everyone has specific requirements and so offer all types of services depending on the religion you follow. While we recommend you opt for Long Beach Harbor for the burial-at-sea, we also offer these services at Newport, Catalina Island and San Pedro. We have been awarded the designation of a public benefit, non-profit, charitable trust organization, to The Last Watch Foundation by the Secretary of State and Attorney General, Department of Justice, as well as the Department of Consumer Affairs for the State of California. We are the only organization in the U.S to be awarded this honor. Prayers will be said at the ceremony and the ashes will be accompanied with rose petals and roses and provide free professional photography services. In this service, we make arrangements with the Mortuary/Crematorium to pick up more than one set of ashes and have them delivered to us. 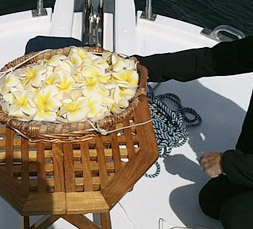 When we are handling the ceremony, we manage it in the same way we would had there been family members on board. We also hold individual ceremonies for every individual at different locations. Prayers will be said and flower petals will be sprinkled in the ocean as every set of ashes is slowly lowered in to the sea waters. In this service, the family members meet us or we will receive a single set of ashes via mail. A private ceremony will then be performed out at sea and if requested, we will mail pictures of the event to the family member as well. In addition we also have the attended memorial services where family members of the deceased military veteran are present. You can decorate the basket that contains the ashes and participate in the ceremony of lowering the basket as well. This is followed by prayers, sharing of stories and a memorial talk. In short, we do everything we can to ensure the occasion is special. The Angel’s Ashes’ services are not just for the military, they are for the general public as well. As a non-profit organization, you find that our military burial services cost is very affordable. For more information about our services and for any other queries you may have, please feel free to call us at this number- 714-393-9999, and we will answer even in the early evenings and weekends. You can also send us your queries via this email address or Contact Us form.